Eczema is a common immune system related incurable skin condition that is characterised by very itchy, dry and inflamed skin. The recurring nature of Eczema makes it hard to control. It may seem to completely heal at times; however, often it will return at random or as a result of environmental or bodily triggers known or unknown. Eczema is often found in children under the age of 5. Around 75% of children that suffer from Eczema will carry the condition on into later life and often other immune system problems can appear in conjunction with it ie. asthma and allergies. Conventional treatments often involve steroid based creams that only serve to temporarily mask the symptoms. Luckily, as with most common health issues there are a number natural options and remedies that can help you and your family avoid the use of cosmetic and pharmaceutical chemicals. The skin feels dry and hard. Inflamed skin is itchy. Often this can become very intense and extremely uncomfortable. Whole areas of the skin become red, inflamed and painful. Excessive scratching can lead to blistered and weeping sores. Skin can become infected by bacterial and fungal microbes. The antibacterial, antifungal and antiviral properties of coconut oil make it perfect for treating any skin based infections. It can also help to relieve itching and reduce inflammation. Coconut oil is brim full of healthy vitamins and nutrients, including Lauric acid, Caprylic acid, vitamin K and vitamin E, all of which help to nourish your skin and decreases the itching and flaking often associated with Eczema. They may also help to remove dead skin cells and microbes. Coconut oil contains a rare type of fat known as Lauric acid that is commonly associated with mother's breast milk. This unique substance is highly toxic to skin based micro-organisms. Coconut oil works as a powerful moisturiser that can be used both on hair and on skin. The moisture offered can be especially useful for people suffering from Eczema as it softens the skin making it more supple and helps avoid cracking and bleeding and therefore can make movement less painful and the skin more comfortable in general. Tired of itching constantly? 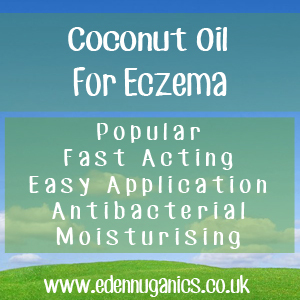 Apply coconut oil to your Eczema for instant relief that will last up to an hour! This can be repeated throughout the day while symptoms persist. Heard of medium chain fatty acids? Well, coconut oil is packed full of these unique fats that help to restore the protective layers of the skin and reduce inflammation. Other Natural Remedies For Eczema? Apple Cider Vinegar - ACV is one of those amazing health products that seems to be able to help with everything. Eczema is no exception. Simply applying apple cider vinegar to the affected areas twice a day will not only help to kill any unwanted microbes, but also relieve the itching associated with this often nasty skin condition. Apple cider vinegar can also be added to bathwater for a full body soak. Magnesium Baths - Magnesium Chloride flakes are another great natural treatment for Eczema. Simply dissolve around 250g in a full bath of water and soak for around 20 minutes. Magnesium is also a muscle relaxant that will leave your body feeling calm loose and supple.